Lions, Tigers, and Bears. Oh my. Every year I have to go see a medical eye doctor, and every year I leave the office feeling as if I was turned into a vampire. “Why is this?” You say. Well, let me tell you. Eyes are an important part of the diabetes. I need to have my eyes dilated yearly so the doctor can look for signs of diabetic retinopathy. I fear this. This could make me go blind eventually. The whole point of going to the doctor yearly is to catch this early enough so I could have surgery and fix it, that is if I ever get it, which I probably will, that seems to be how my luck is rolling these days. The dialation is the worst part of the exam, it’s evil and the cause of my vampiredness. Have any of you ever had this done? If you have, you would understand how impaired your vision becomes under it’s wrath and how wide your pupils get…not to mention how sensitive to the light you become. I bust out of there saying this as I hold an arm up to my head in hopes of blocking out the sun. The doctor’s office is located in a busy area of town and there were many people out and about. I’m sure I looked like a stumbling freakazoid to passerbys. 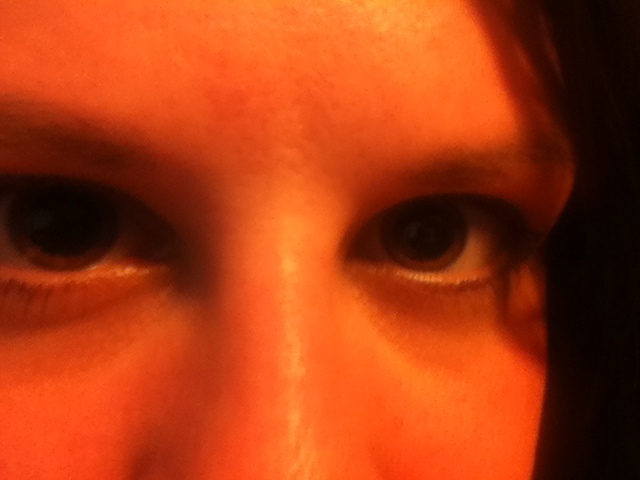 I am posting the picture below not to be a creepy person, but to show you how demonic my eyes became. You can barely see the color of my eyes the pupils are so dilated! Ahh!!! The light!!! I guess it has something to do with blood vessels and my corneas. The doctor was useless in my questions. He referred me to a specialist. “Doctor Ditz, does this have anything to do with the diabetes?” I say. I didn’t say that, but I thought it. I mean seriously. I sat a room for 20-30 min waiting for my eyes to dilate, doctor comes in for literally 5 min to examine my eyes. In and out, leaving me with a million questions. He walks me out to the front desk and tells the nurse who is to make my appointment with the specialist that there is no hurry to get me in right away, but “it should be done in the next two weeks.” Ummm…sounds like a hurry to me! So, that was a bummer. I think it is something that could be easily fixed. I guess I’ll find out in two weeks. I’ll be honest here I’m getting sick of all this stuff coming about this year…well, basically just the lump, and now this (which may have nothing to do with the diabetes). It’s frustrating, but we all have our crosses to bear.